The Sixth Form College, Solihull are celebrating BTEC success, with final grades revealed this week, revealing 187 starred grades. There are 147 second year BTEC students, who have just finished their studies at the College. They have been studying one of six BTEC Extended Diploma courses in Art & Design, Applied Sciences, Business, Health & Social Care, IT Practitioners or Sport. BTEC Extended Diploma courses are equivalent to studying three A levels and are graded with distinction* (star), distinction, merit and pass grades. 81 students (55%) got at least one distinction* grade, with 43 of these students achieved the top triple distinction* grade. One of the most successful BTEC courses at the College this year was BTEC Sport, which saw a 100% pass rate and every students achieved at least two distinction* grades. Most of the students on this course are heading to university, with both Seb Breeze and Chloe Mason heading to the University of Birmingham to study the BSc Sport, Physical Education and Coaching Science course. In BTEC Art & Design there has also been a 100% pass rate this year, with 65% of students achieving at least one distinction* grade and every student getting at least one distinction grade. 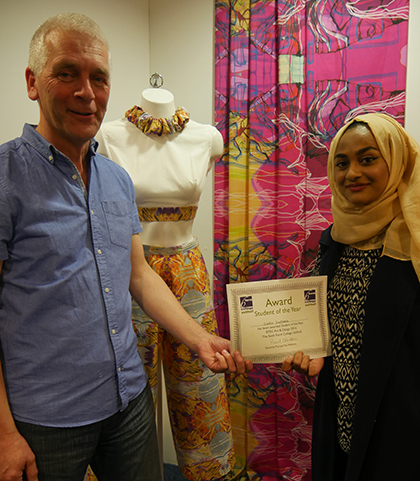 Among the most successful students on the course was Sadia Sultana (pictured right), who got a triple distinction* grade and was recently awarded a prize by the Arden Decorative & Fine Arts Society for her outstanding textiles work. BTEC Health & Social Care has also had a successful year, with every student achieving at least two merit grades on the course and 61% of the students getting the very top grade of triple distinction*. Samantha Butterworth and Sabrina Ellahi are two of the students to get the top grade and both are heading to Birmingham City University in the autumn to study Nursing degrees. The BTEC Applied Science Extended Diploma course has seen a 100% pass rate this year, with 65% of students achieving at least one distinction* grade. Most students are progressing to university, including Punit Pankhania, who will start a Physiology with Pharmacology degree at the University of Leicester this autumn. In the BTEC IT Practitioners course, every students on the course passed and 65% of the students got at least one distinction grade. Sailesh Patel was one of the students to get the very top grade and he is putting those results to excellent use, with a place at Aston University to study Computing Science coming in the autumn. The final BTEC Extended Diploma course offered at the College is in Business. On this course, 68% of students got a triple distinction grade or better. Most students on this course are taking up university places in the autumn, although a few have chosen apprenticeships and some are even going directly into employment. Among the university destinations that students on this course are taking up are Aston University, the University of Birmingham, the University of Manchester and the University of Southampton. “Well done to all the students on our BTEC courses for their hard work. These courses involve a tremendous amount of coursework, so they have really had to work to achieve these grades. It sets them up well for whatever challenges they have ahead, with the majority of them heading off to university. I wish them all the very best of luck!